This is a protocol changer for the MW2 Spec Ops mode I found while looking for a way to play with someone who had the german version of MW2, while I had the english. 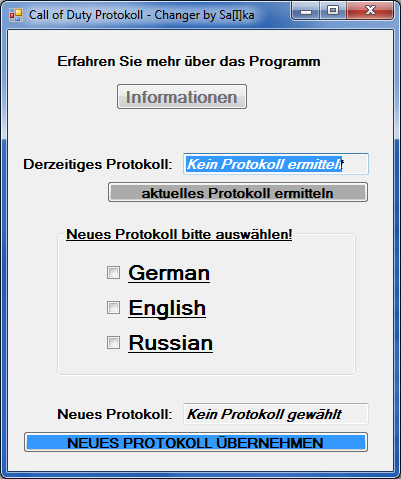 It detects and changes the protocol from russian, english and german to whatever you like. This will not trigger a ban whatsoever, since VAC is not running in SP. Since the program is german and most of you probably don’t know (meaning speak/being able to read) that language, here’s an explanation on how to get it working. 1. Start the program, while MW2 SP is not running. 2. Press the button “aktuelles Protokoll ermitteln” which means “find out which protocol you’re using”. 3. An explorer window opens asking you to select your iw4sp.exe, navigate to your steam folder and open it. 4. Now it should say “geman”, “russian” or “english” in the input field, depending on which protocol you’re using right now. 5. Select which protocol you want to use by clicking the checkbox next to one of the three possibilities. 6. Press the “neues Protokoll übernehmen” button, if it worked the input field now should show the protocol which you just selected. Note: The protocol version will remain at the one you changed it to, so if you want your another one you’ll need to change it to that again! I have searched for “protocol changer” with the forum search, but couldn’t find anything. I have not created this program. If there’s any questions left, feel free to message me.